With its unique snap-in modular design, the Inductrix Switch quickly transforms from a hovercraft to a drone in seconds. No tools required, and you don’t even have to unplug the battery! 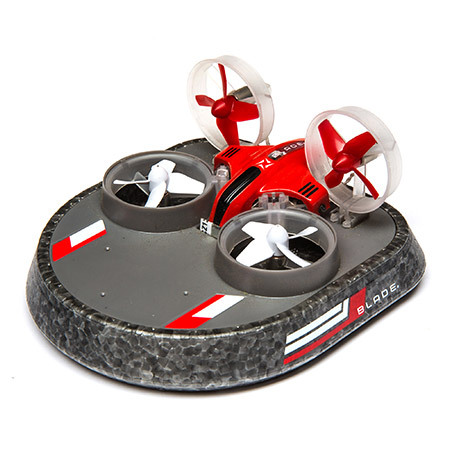 Change the flight controller programming from drone to hovercraft with simple stick commands. The on-board LED will indicate which mode you are in. Efficient airflow diversion in the EPP foam skirt and variable pillow control allow the Inductrix Switch to glide across multiple surfaces including carpet, concrete, asphalt, packed earth, and much more. A circular rounded nose makes it difficult for to get stuck against a wall. Simply add left or right power, and the hovercraft rolls out to a controllable area. In drone mode, any indoor space is your playground. Just pop the craft out and go. Dedicated mounting position on the front of the hovercraft and simple plug on the board is ready to host the optional FPV camera with On Screen Display. Vital data such as battery voltage, video frequency and channel, run time, and call sign displayed right on your screen. Change your video channel directly from the OSD, even on the stock MLP4 transmitter. From a Spektrum Gen.2 transmitter, channel and frequency can be selected in the video transmitter menu.